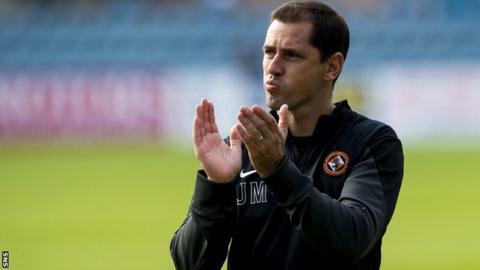 Dundee United manager Jackie McNamara insists there is more to come from his side after seeing them dismantle Dundee 4-1 to go top of the Premiership. The Tannadice outfit cruised to victory in the first Dundee derby of the season at Dens Park. "We had to go out and match them first and foremost, but I still feel we can pass it better," McNamara said. "When we do move the ball quickly and move it into little areas you can see we have players that can hurt them." The United manager said referee Steven McLean was right to award the penalty that led to his side's opening goal of the game. Gary Mackay-Steven went down in the area under a challenge from Thomas Konrad and Mario Bilate scored from the spot. And McNamara felt the visitors could have had another spot-kick. "From where I was I thought it was a stonewaller," he told BBC Scotland. "And the referee has had a word with me after [Chris] Erskine's gone through, I thought he was taken out at that one." Ryan Dow, Callum Morris and Keith Watson were also on target for United before Konrad was red-carded for a second booking and Greg Stewart scored late on for the hosts. The sides meet again on League Cup duty at Tannadice on Wednesday night, and while McNamara was delighted with his team's display at Dens, he will take nothing for granted in midweek. "As a team we were excellent, organised and disciplined. The back four were outstanding, [Paul] Paton was immense and the rest of them were very good," he added. "There's little things I'd be slightly critical of in terms of the last pass going into the final third, but we carried a threat all afternoon. "They will be hurting but it doesn't matter what the situation is, it's a local derby. For us, we have to make sure we do the same job." Bilate was thrilled to play his part in the victory that sent United top of the Premiership on goal difference. "We did a great job and I think we dominated them throughout the entire match," he said. "I was very confident when I stepped up to take the penalty. I hoped it was a penalty, the first thing I did was look at the referee and as soon as he pointed to the spot I knew I had a job to do."